Celebrating its Centenary in 2008, the University of Pretoria (UP) is a leading research university in South Africa and one of the largest in the country. UP offers more than 1800 academic programmes offered in nine faculties, as well as a business school and is at the forefront of tertiary education in the country through collaboration with partners of excellence in learning and teaching. The vision is international recognition for the relevance and impact of its research, as well as for developing people and making a difference both locally and globally. 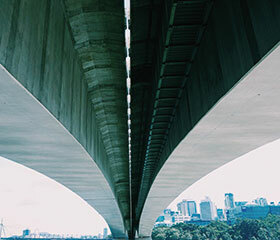 Creep testing in concrete is a lengthy process carried out under specified conditions to test the tendency of concrete to move slowly or deform permanently due to exposure to natural elements and mechanical forces. This is a critical measurement in building technology, as it influences structural design and mixing ratios in building materials. The Department of Civil Engineering at UP perform creep testing manually by logging and measuring creep with a dial gauge attached to a concrete specimen. Typically, creep testing can run for a period of six months to two years, thus requiring excessive human input and introducing a high probability of error or omission, rendering invalid results. Once data is captured, it then has to be entered into a programme for further analysis. The solution required a data logging system that UP could install, configure and operate with relative ease. Additional capabilities required included autonomous data capturing over an extended period with minimal human intervention, with the ability to cater for future expansion. • Continuous data acquisition at specified intervals. • Dynamic calculations based on the acquired data. • Graphical representation of the data. • Automated archiving of the data. • Alarming of out of limit conditions. Yokogawa’s GM Datalogger is a fit for purpose system designed for easy integration, which allowed UP to install the unit themselves. The user-friendly graphics and analysis tools ensured a short start-up time, enabling UP to begin automated creep testing almost immediately. 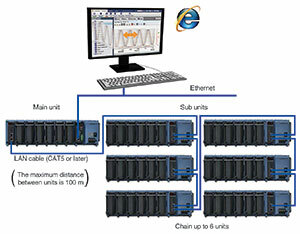 The unit is a rack-mounted, expandable data acquisition system designed to cater for high channel count, distributed datalogging applications and it is coupled with a graphic logging, reporting and analysis software package (GA10) to complement the analysis capabilities. In future, the expandable nature of the design will allow UP to extend the system to other test stations in the faculty.